Two identical spacecrafts, Voyager 1 and Voyager 2, launched from Cape Canaveral in Florida in 1977. 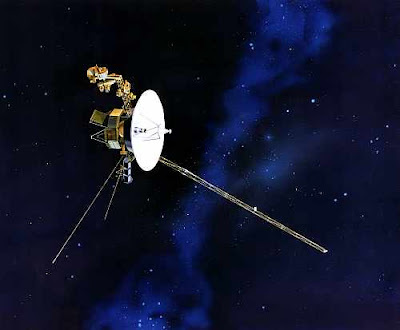 Voyager 1 left the Earth on September 5, Voyager 2 on August 20. Their primary mission at the time was to study the planets Jupiter and Saturn. Scientists at the University of Colorado at Boulder designed and built identical instruments for Voyager 1 and Voyager 2. Voyager 2 went on to visit Uranus and Neptune. Now NASA has announced that Voyager 1 -- about 11 billion miles from Earth -- has now sailed to the edge of the solar system and is expected to punch its way into interstellar space in the coming months or years. Voyager 2 is not far behind, but on a different trajectory. This makes Voyager 1 the farthest human-made object from Earth. The scientists were as stunned as anyone when the spacecraft began sending back data to Earth. The science discoveries by Voyager started piling up: Twenty-three new planetary moons at Jupiter, Saturn, Uranus and Neptune; active volcanoes on Jupiter's moon, Io; Jupiter's ring system; organic smog shrouding Saturn's moon, Titan; the braided, intertwined structure of Saturn's rings; the solar system's fastest winds (on Neptune, about 1,200 miles per hour); and nitrogen geysers spewing from Neptune's moon, Triton. Voyager probes at the doorstep of interstellar space. Communication with both Voyager 1 and Voyager 2 is regularly maintained to monitor conditions in the outer edges of the solar system. Both probes have radioactive power sources that up to now, still produces electric power to run the crafts which are travelling at around 35,000 miles per hour. Charlie Hord, a former planetary scientist at CU-Boulder's Laboratory for Atmospheric and Space Physics (LASP), recalls some of the discoveries, "All of the scientists were dazzled by the pictures of the moons of Jupiter and Saturn coming back. To finally look at them up close was the most remarkable thing I've ever seen in my life." The LASP photopolarimeter, a small telescope that measured the intensity and polarization of light at different wavelengths, was used for a variety of science observations during the mission. The instrument helped scientists distinguish between rock, dust, frost, ice and meteor material. And it helped scientists determine the structure Jupiter's Great Red Spot, which Hord called "a giant hurricane that has blown for 200 hundred years," as well the properties of the clouds and atmospheres of Jupiter, Saturn Uranus and Neptune, and Saturn's largest moon, Titan. The CU-Boulder instrument also was used to learn more about the make-up of the Io torus, a doughnut-shaped ring around Jupiter formed by volcanic eruptions from it's moon, Io, as well as determining the distribution of ring material orbiting Saturn, Uranus and Neptune and the surface compositions of the outer planet moons. One of the finest mission moments for Hord was analyzing the data returned from the photopolarimeter when it was locked on the star Delta Scorpii as it emerged from behind Saturn and passed behind the elegant rings in a "stellar occultation" when the light from a star is blocked by an intervening object. The processed photopolarimeter data showed each ring was made up of numerous smaller ringlets. "They were beautiful -- they looked just like the grooves on a phonograph record," he said. Last December 2010, Voyager 1 reached a region of space where there was no net velocity of the solar wind. At this point, the wind from the Sun may be canceled out by the interstellar wind. It does not appear that the spacecraft has yet crossed the heliosheath into interstellar space. On June 2011, Scientists studying the Voyager data noticed what may be giant magnetic bubbles located in the heliosphere, the region of our solar system that separates us from the violent solar winds of interstellar space. The bubbles, scientists believe, form when the sun's magnetic field becomes warped at the edge of our solar system. On the off chance either spacecraft is encountered by an alien civilization, each are carrying what are known as "Golden Records" -- gold-plated copper, audio-visual phonograph records with greetings in 50 languages, photos of people and places on Earth, the sounds of surf, wind, thunder, birds, and whales, diagrams of DNA and snippets of music ranging from Bach and Beethoven to guitarist Chuck Berry's classic rock-and-roll song, Johnny B. Goode. The spacecraft even carries a stylus set up in the correct position so that aliens could immediately play the record, named "Murmurs from Earth" by Carl Sagan, who conceived the Golden Record effort. "I thought adding the Golden Record to the mission was a neat thing to do," said Hord. 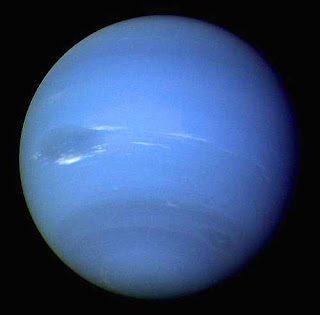 A guitar player himself who performs jazz and Big Band music with a trio that visits Boulder retirement homes, Hord recalled that JPL threw the Voyager team a party to celebrate the end of Voyager 2's Grand Tour as it passed by Neptune in 1989 (Pluto was in a distant part of its orbit at the time). "We even had Chuck Berry playing his guitar on the steps of the Jet Propulsion Laboratory," he said. "It was really something." In 1990, Voyager 1 turned around one last time and took a portrait of the solar system -- a sequence of photos that revealed six of the nine planets in an orbital dance. From nearly 4 billion miles away, Earth took up only a single pixel. "To me, Voyager was the most fun and interesting planetary mission ever," said Hord, who enlisted the help of then-graduate science students Carol Stoker (now a NASA planetary scientist) and Wayne Pryor (now a professor at Central Arizona University) to analyze data from the mission. Over its lifetime, the CU-Boulder photopolarimeter science team also included LASP Professor Larry Esposito, Senior Research Associate Ian Stewart, retired faculty members Karen Simmons, Charles Barth and Robert West, as well as tireless work by many undergraduate and graduate students. Esposito, who is still at LASP and is the principal investigator on a $12 million CU-Boulder instrument package aboard NASA's Cassini Mission to Saturn, said his biggest thrill of the Voyager mission was the Neptune fly-by in 1989 when the gas giant "went from being a small blurry dot to a planet with bright clouds and numerous moons and rings. "Triton erupted before our eyes, and Neptune's partial rings were punctuated and variable like a type of sausage that the French make." Then-CU President Gordon Gee was so impressed with the blue image the LASP team made of Neptune's ring system that he used it on his Christmas cards, said Esposito, a professor in the astrophysical and planetary sciences department. Esposito believes the biggest discovery by CU-Boulder's Voyager photopolarimeter team was the intricate structure of Saturn's F ring -- a ring he discovered in 1979 using data from NASA Pioneer 11 mission. The CU-Boulder team determined the faint F ring was made up of three separate ringlets that appeared to be braided together, and that the inner and outer limits of the ring were controlled by two small "shepherd satellites." In addition, Esposito said that density waves -- ripple-like features in the rings caused by the influence of Saturn's moons -- allowed the team to estimate the weight and age of Saturn's rings. As for Hord, the Casper, Wyo. native went on to be the principal investigator for two spectrometers designed for NASA's Galileo Mission to Jupiter that launched in 1989 to tour the Jovian system, including its bizarre moons. Hord officially retired in 1997, but returns to campus for occasional visits with his colleagues. Rocketing at roughly 35,000 miles per hour, Voyager 1 will float within 9.3 trillion miles of the star AC+793888 in the constellation Camelopardalis in about 40,000 years. In 296,000 years, Voyager 2 will pass within 25 trillion miles of Sirius, the brightest star in the sky. Perhaps on the way, the spacecraft will encounter some musically inclined aliens up for a little Bach, Beethoven or Berry.